Earn up to 1,625 reward points. 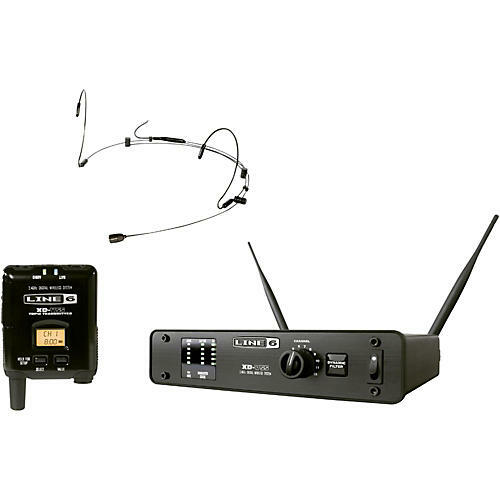 The fourth-generation digital wireless solution for active performers. The XD-V55HS Digital Wireless System from Line 6 sets a new standard in hands-free wireless systems for active performers and presenters. Offering spectacular audio quality, XD-V55HS systems feature exclusive EQ filter modeling technology combined with a proven 4th-generation digital wireless platform, the most mature in the industry. With 12 channels of 24-bit, 10Hz-20kHz, compander-free performance, the XD-V55HS provides unmatched full-range audio clarity and license-free operation worldwide. XD-V55HS gives you the flexibility to choose from three EQ filter model types, optimizing the sound of the system for your voice and mic placement. Using the selector button on the transmitter bodypack, you can easily audition and choose from the available EQ filter models.The included adjustable headset features a premium omni-directional condenser capsule and fits comfortably and securely for the clearest sound. The XD-V55 features an intelligent Dynamic Filter to minimize environment noise and ensure your voice cuts through with real clarity. The signal from XD-V55HS is so clear and strong that it actually sounds like a wired microphone, but with all of the advantages of wireless, hands-free performance. Unlike traditional analog wireless systems, the XD-V55HS does not use signal companding, so the full 117dB dynamic range (A weighted) is available at all times. other 2.4GHz devices and ensures signal integrity. Confused by wireless license fees? No need to worry, XD-V55HS is fully FCC compliant and operates license-free worldwide. together automatically - job done. The professional headset features a wraparound adjustable fit to secure the premium condenser capsule for the clearest possible sound. The headset is available in standard black or discrete tan finishes. The lightweight body pack features an LCD screen for selecting channels and EQ Filter Models, and displaying battery level. The XD-V55 receiver is housed in a robust aluminum chassis. Three 5-segment LEDs give constant visual feedback to monitor RF strength, battery status and all audio levels. Up to 12 XD-V55 systems can be used simultaneously. Latest generation digital wireless makes your performance more dynamic. Get yours today.